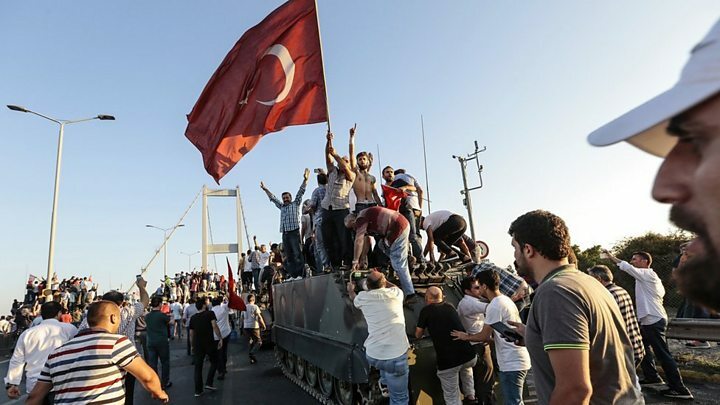 Turkey has arrested 6,000 people after a failed coup, with President Erdogan vowing to purge state bodies of the "virus" that caused the revolt. Mr Erdogan's top military aide Col Ali Yazici is among those now in custody. Warning shots were fired at Istanbul's second largest airport, and also at a military base in central Konya province, unnamed officials said. "We will continue to cleanse the virus from all state institutions, because this virus has spread. Unfortunately like a cancer, this virus has enveloped the state," Recep Tayyip Erdogan told mourners at a funeral in Istanbul for victims of the coup. Mr Erdogan broke down in tears while speaking at the funeral of a close political ally, his campaign manager Erol Olcak, and his teenage son. He said he would take the country forward in "unity and solidarity". The president repeated an accusation that cleric Fethullah Gulen was behind the plot, and called for him to be extradited from the US. Mr Gulen strongly denies any involvement. Media captionWhy did the coup in Turkey fail? Emotions are running high as funerals for those killed during the coup plot are held. 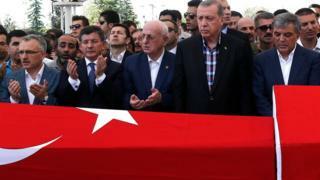 President Erdogan was among those mourning in Istanbul for the brother of one of his closest advisers. "My glorious nation has given the best response to the coup plotters," Mr Erdogan said in a televised speech frequently interrupted by chants of "God is Great!" Whenever he made a reference to Fethullah Gulen, the roar of boos would come from the crowd. Turkey has been through a dramatic 48 hours, on a scale even this country - with a turbulent past of three previous coups and a further two military interventions - had never seen before. And it is not totally over yet. As more than 6,000 have been detained and the expectation that numbers could rise further, one Twitter user commented "this is an opportunity for the governing party to cleanse out all opposition to the presidential system". Mr Erdogan's critics wonder if he could he make use of the latest events as leverage to push harder for a constitutional change that would further enhance his powers. People are rallying in cities including Istanbul and Ankara, to show support for the government. Mr Erdogan told a crowd that Turkey would consider reinstating the death penalty. He said: "In democracies, decisions are made based on what the people say. I think our government will speak with the opposition and come to a decision. Among the latest arrests to be reported was the commander of Incirlik air base in the south used by US-led coalition jets for raids against the so-called Islamic State group in Iraq and Syria. Unnamed officials said Gen Bekir Ercan Van and 10 other soldiers had been detained for their role in the coup. Also on Sunday, more than 50 senior soldiers were detained in the western province of Denizli, including the garrison commander. One of Turkey's most senior judges, Alparslan Altan, has also been taken into custody. US Secretary of State John Kerry said of any extradition, that Turkey should "present us with any legitimate evidence that withstands scrutiny". Mr Gulen has denied any involvement in the coup. He has been in self-imposed exile in Pennsylvania for the past 15 years, and said: "I don't even know who my followers [in Turkey] are." He suggested Mr Erdogan may have staged the attempted coup himself in an attempt to tighten his grip on power. Mr Kerry strongly rebuked a Turkish minister who suggested Washington was behind the coup. He said "utterly false" insinuations were "harmful to our bilateral relations". US President Barack Obama has joined other world leaders in calling for all parties in Turkey to "act within the rule of law". Media captionFethullah Gulen: "There is a possibility it could be a staged coup"
Are you in Turkey? How has the coup attempt changed the country? Have you been affected by recent events? What are your hopes and fears for the future? You can email haveyoursay@bbc.co.uk with your experiences.